In the fall of 1910, Mr. Mather was the nominee of the republican party for the office of representative to the state legislature, but, owing to the fact that a three-cornered fight was pending, he withdrew his name, and gave his support to his republican opponent to insure the election of a man favorable to the temperance cause, as the campaign at that time in Nebraska was practically between the "wets" and "drys." He is a man of high principle, with very pronounced ideas of right and wrong, and determined in his support of any cause he espouses. In politics he now works with the people's independent party. He is a member of the Congregational church, and affiliates with the Independent Order of Odd Fellows. Mr. Mather was born in a log house, and attended school in a school house of that primitive construction. On coming to the west, he had the pioneer privilege of living eight years in a "soddy," an experience no early settler should miss. For a time he used corn for fuel, when that cereal was selling for nine cents a bushel. The dry year, 1894, he raised but ninety-six bushels of wheat and one hundred and four bushels of corn on his entire farm. The oft-mentioned blizzard of January 12, 1888, found Mr. Mather in town, and, although the storm was suffocating, he made his way home. Residence of Daniel E. Mather. A leading old-timer of Pierce county, Nebraska, is found in the gentleman above mentioned, he having come to this portion of the state about 1881, when the region was just beginning to be settled by those who had come to this country to build up homes and fortunes through industry and perseverance, and who, by dint of good management and oftentimes much privation, have accumulated a competence to last them through their later years. Mr. Holmes resides on the southwest quarter of section five, township twenty-six, range three, where he has a comfortable home, and is held in high esteem by a host of warm friends and good neighbors. He also has a forty-acre tract a few miles northwest of the home place. Mr. Holmes was born in Tama county, Iowa, August 7, 1865, and is the son of George W., senior, and Mary (Moats) Holmes. Our subject's father was born in Illinois in 1835, and died December 19, 1908, aged seventy-three years. The mother died in August, 1905, at the age of sixty-nine years. In the sixties, Mr. Holmes moved to Tama county, Iowa, and later, with his family, drove to Dickinson county, where they took up a homestead in 1870, and resided until 1880. In that year they came to Pierce county, Nebraska, and here the father took up a tree claim in section five, township twenty-six, range three, on which our subject now lives, and on which were planted twelve acres of trees. Later he secured one hundred and sixty acres under the pre-emption law, and on this tract the family lived in a sod house for two years in true pioneer style. Like other pioneers in the days of earliest settlement, the family burned twisted hay for several years before coal could be secured at prices people could afford to pay. Deer and antelope were plentiful in those days, and furnished the settlers a supply of wholesome meat at a time when food was scarce. Mr. Holmes was united in marriage to Miss Lorena Bigger, April 20, 1895. Mrs. Holmes is a native of Ohio, a daughter of David Bigger. Of this union have been born three children: Isa, Willard and Esther. Mr. Holmes is a member of the Modern Woodmen and Odd Fellows lodges, and votes the democratic ticket. Mr. and Mrs. Holmes and family are highly respected and esteemed by all who know them. Dellmond A. Geil, a young man of much promise, was for a number of years one of the public-spirited citizens and popular business men of St. Paul, Nebraska. He was born in Hocking county, Ohio, September 14, 1872, living there until in his eighth year, then, with his parents, went to Iowa, settling in Norwalk, where they lived for three years. From there they moved to Hayes county, Nebraska, the father following ranching for several years. Mr. Geil received his early education in the common schools of Nebraska, later spending three years at York College, and also went to the Western Normal College at Shenandoah, Iowa for one year. He had a distinct leaning toward the church, and in the spring of 1897, began preaching, coming to Howard county, where he was given the pastorate of the First United Brethren church at Elba, and carried on this work for five years, during part of the time later was a teacher in the schools of Howard county. Magazine, being the secretary and treasurer of, the company. Mr. Geil was married in November, 1899, to Carrie J. Baliman, at the home of the bride's parents, Mr. and Mrs. W. H. Baliman, who lived just west of St. Paul. They have a family of two children, Lela D. and Marion A., both now attending school. Mrs. Geil died on September 14, 1904, as a result of an accidental explosion, and her death was deeply mourned by her devoted family and a large circle of friends. It was made especially pathetic because of the unfortunate accident. Mr. Geil was married again in 1905, to Miss Zetta S. Springer, of Leon, Iowa, the ceremony taking place at Kansas City, Mo., and to this union two children have been born, Dellmond A. Jr., and Mildred L. Mr. Geil and his wife occupy a high position in the social life of the community in which they reside, and the former is regarded by his fellow men as a young man of high capabilities who has a brilliant future before him. Cash M. Routh has for the past quarter of a century been influential in the development of Nebraska in various lines, and he and his wife now have a very comfortable home in Valley county, where he has developed an excellent farm. Mr. Routh was born in Warren county, Illinois, September 9, 1861, sixth child of David and Eliza (Collins) Routh who were parents of seven sons and four daughters. Both parents were natives of Indiana, the father born in Floyd county, in 1827. He was a pioneer settler of Illinois and Missouri and died in the latter state October 16, 1910. The mother died in the same state, January 21, 1892. The family located in Nodaway county, Missouri, in the spring of 1882. Of their eleven children the following seven now survive: Elza is married and living in Norfolk, Nebraska; Cash W. of this sketch, the only other member of the family in Nebraska; three daughters, Mrs. Harvey Churchill, Mrs. Charles Umphrey and Mrs. Ed McIntire, all of Missouri; John, of Oklahoma; Edward, of Marshalltown, Iowa. Mr. Routh was reared on a farm, accompanied his parents to Missouri in boyhood, and lived at home until he attained his majority. He was married in Nodaway county, September 11, 1882, to Miss Minnie Weddel, daughter of Joseph M. and Julia (Bugby) Weddel, and one of their three children. Both parents are deceased. Their son Alfred E. lives in Valley county and their daughter Cora B., (Mrs. Dade M. Quigley), lives in Hayes county. In September, 1885, Mr. Routh and wife came to Jefferson county, Nebraska where they rented a farm for a time and later bought land. In September, 1895, Mr. Routh became connected with the Omaha Van and Storage Company and lived for about ten years at Omaha, In 1905 he purchased the northwest quarter of section fourteen, township seventeen, range sixteen, Valley county, to which place he moved in March, 1907, intending it as a permanent residence. He devoted his place to grain cultivation and stock raising and is recognized as an upright, desirable citizen. He and his wife have won many friends in their new home. Mr. Routh well remembers the blizzard of Jannary 12, 1888, when he tried in vain to get his cattle into shelter; however they drifted in a plum thicket in a canyon and none were lost. Mr. Routh is republican in politics and a member of the Modern Woodmen of America. John F. Neidig, whose biography forms an interesting page in the history of the early settlement of Nebraska, is a resident of township twenty-two, range one, where he lives on section twenty-nine, Madison county, and is widely known and highly esteemed. He has developed a fine farm and home there, and is one of the energetic and progressive farmers, well meriting his success and enviable reputation. Mr. Neidig has lived in his present home ever since his arrival in Madison county, which was in 1876. Mr. Neidig is a native of Saxony province, Germany, in which country he was born June 2, 1843, a son of Barbara and Nicholas Neidig. The father served in the war under Napoleon against Wellington in 1815, and could relate many interesting reminiscences of that eventful time. Our subject's grandfather is a native of sunny Spain, but later became a resident of the German Empire, where he was employed in an organ manufactory. John F. Neidig, subject of this writing, came with his parents to America in 1844, sailing from Hamburg, Germany, to New York on the sailboat "Isaac Newton," and the family were on the sea eighteen weeks. They remained in New York ten years, and then moved to Kankakee, Illinois, where they lived for twenty-two years. In 1876, our subject started for the west to make his fortune, making final settlement in Madison county, where he bought land. Mr. Neidig improved his land he had purchased from the railroad, putting up good buildings, etc., and now has a beautiful home. In the early days of settlement here, Mr. Neidig suffered many hardships and losses through the different causes incidental to those times, and as late as 1894 lost all his crops by the hot winds that prevailed during the. drouth of that season. In 1865, Mr. Neidig was united in marriage to Miss Anna Seiger, and they were the parents of seven children. In 1891, Mr. Neidig was again united in marriage, the bride being Miss Maggie Dorr. Mr. and Mrs. Neidig reside in their beautiful home, where they are surrounded by a host of good friends and acquaintances. Frederick C. Embree is one of the best known men of Custer county and has passed through many stages of Nebraska history. He has long been closely identified with the best interests and development of the county and had many interesting experiences of frontier life. In early days he did freighting between Kearney and Merna and in this way had an opportunity to study the possibilities of various parts of the state. He has always had faith in the future prospects of Nebraska and believes there will be wonderful opportunities for his children there. He was born in Washington county, Iowa, August 23, 1864, and has spent most of his life in Nebraska. He is a son of Noah Embree, who is mentioned at length in the succeeding paragraph of this article. Noah Embree was born in Vermillion county, Illinois, February 22, 1833, a son of Jesse Embree, who was a native of Preble county, Ohio, and came to Illinois as a young man. He was married in Vermillion county to Mary Hollingsworth, and both he and his wife were of Quaker parentage, although the Embree family came from England to America and were originally of French descent. Jesse Embree carried on a farm in Illinois until 1840, then moved to Washington county, Iowa, where he became owner of five hundred acres of land. He added to his holdings from time to time and became well known for his prosperity and success. His wife died in 1851 and he in 1858. He had six children. Noah Embree remained on the home farm until after his father's death, receiving his education in the public schools and becoming well acquainted with farm methods. After the death of his father he carried on the farm until the spring of 1870, then disposed of his interests in Iowa and went by wagon to Nemaha county, Kansas. Not being pleased with the outlook there, he went on to Otoe county, Nebraska. Mr. Embree was married in Keokuk, Iowa, June 17, 1858, to Miss Margaret Lyon. She was born in Jefferson county, Iowa, July 25, 1841, a daughter of Frank and Rachel (Harris) Lyon. The mother was a native of Illinois, and the father of New York, but the family soon after removed to Nashville, Tennessee. Six hundred acres of the town site rightfully belongs to them - the papers left for record were neglected and the title thus lost. Noah Embree lived in Otoe county until 1893, then came with his wife and daughter to Custer county, where he purchased the Penn ranch near Callaway; five sons had preceded him and were then well established in Custer county. Mrs. Embree died on this place June 21, 1898, and Mr. Embree remained there until 1907, when he came to live with his son Frederick, in Merna, where he died March 24, 1909. He and his wife had eight children, two of whom died in infancy; he was survived by five sons and a daughter: Allen L., lives in Sunnyside, Washington; Oliver H., in Fullerton, California; Frederick C., in Merna; Jelin W., presiding elder in the Methodist Episcopal church, of the Nebraska City District, is located at University Place, Lincoln, Nebraska, where his children attend the school; Noah M., is in Athens, Georgia, and Mary married George A. Shaw, and died in Seattle, Washington, July 6, 1910. The father was a man of strong character, active along business, educational and religious lines and highly respected by all. In advising his young sons he displayed his usual good judgment and acumen by telling them when they saw him smoke or chew tobacco, they could do the same; when they saw him use liquor they could also do it, and that they would be privileged to swear when they heard him do so. Frederick C. Embree came with his parents to Otoe county in 1870, receiving his education in the schools near his father's home there. He was reared to agricultural pursuits and was married in Nebraska City, April 9, 1884, to Miss Altana Myers, a native of Sheffield, Illinois, who came to Nebraska with her parents in the fall of 1882. The father, Samuel Myers, was born in Newark, New Jersey; the mother in the state of New York. She died in Bedford, Iowa, while the family was living there. The father after living successively in Nebraska, Oregon, Iowa, and Nebraska again, now lives in Portland, Oregon, with his two daughters. Upon his marriage Mr. Embree came overland to Ortello Valley and engaged in farming and stock raising there. During the dry years, in the early nineties, when crops were total failures, he gave his attention to stock raising, making a specialty of fine cattle and horses. From time to time purchased more land in Ortello Valley until his ranch farm comprised eight hundred and forty acres. In March, 1905, he purchased two hundred and twenty-two acres of land adjoining the city limits of Merna, and developed it into a well improved stock and grain farm, a beautiful place, having about three hundred cedar trees and known, as Cedar View Stock Farm. He is a successful pioneer of Nebraska, being of the younger men who have passed through so many years of life in Nebraska. He has traveled rather extensively but prefers life in Nebraska to a residence in any other state. He is well-known in the stock markets and has often topped the market with his cattle, being an enthusiast on the business of stock raising. He and his wife have a fine family and all are well-known in social, educational and religious circles. He is a stockholder in the Farmers' Bank of Merna, also in the Farmers' Elevator Company there, and is a member of the Masonic order, being treasurer of the local lodge. ble (twins), and Mattie, reside at home; a son and daughter, twins, died in infancy. Mr. Embree was formerly a republican, but of late years supports whom he considers the most capable man, no matter on what ticket his name appears. During the years the populist party was active, Mr. Embree was delegated by his county to represent them in the state convention to nominate delegates to the National convention. With his wife, Mr. Embree is a member of the United Brethren church; he fraternizes with the Masons, the Odd Fellows, the Workmen, and the Woodmen; and the Rebekahs and Royal Neighbors, as does Mrs. Embree. Louie C. Madsen, an intelligent and prosperous young man of superior attainments in a business way, is also one of the substantial citizens of Cotesfield, Nebraska, where he and his family are favorably known throughout the entire community. Mr. Madsen is a native born Nebraskan, first seeing the light in Howard county, the event of his birth occurring on February 7, 1882. He received his early education in the public schools here, in 1901, taking a course in the Fremont Normal and Business College, where he received a good insight in the manner of conducting business, and after leaving the school spent four years in Elba employed in a clerical position with a well-known firm. He also worked in Dannebrog as bookkeeper with the State Bank of Dannebrog, and eventually was appointed assistant cashier for that institution, remaining with them up to May, 1907, at which time he severed his connection with the bank and came to Cotesfield to accept the position of cashier of the First State Bank of Cotesfield, which he has filled with satisfaction to all concerned, still holding that position. He is a young man of more than ordinary ability and good business acumen, and has before him the prospect of a prosperous and brilliant business career. Mr. Madsen was married on September 18, 1907, to Miss Carrie Lyhne, at the home of her parents in Dannebrog. Mr. and Mrs. Lyhne are well known as one of Howard county's pioneer families, and Mrs. Madsen was reared and educated here. Our subject has one daughter, Lucille Genevieve, a charming little miss, and the pride of her parents' hearts. Benjamin D. Allen, an old settler of Custer county, is a successful merchant of Comstock, and well known in the community as a singer. He as born in Pike county, Illinois, August 26, 1847, next to the eldest child of Alfred B. and Emily (Askew) Allen, and the only one of the family to locate in Nebraska. His father was native of Kentucky, and his mother of Illinois, and both are now deceased. He has five brothers and one sister surviving. He was born and reared on a farm and followed agricultural pursuits all his life until recently. In the fall of 1872, Mr. Allen was one of a party of nineteen, men, women and children, who left Pike county with prairie schooners, and came to Grand Island, Nebraska, where they spent the winter months. The following spring Mr. Allen entered the employ of Christopher Ridell, to go with a crew of inen to St. Paul, Howard county, with a steam saw-mill outfit. Although it was a new line of work for him he soon learned its essential features and became a head sawyer on the big saw. They operated at various points along the Loup river for about two years, and in the spring of 1875 Mr. Allen left this occupation and took a pre-emption claim on the northeast quarter of section eight, township eighteen, range seventeen, Custer county, as well as a timber claim, being one of the very first settlers and an original homesteader in the locality. He was successful as a farmer and stock raiser, and although he had to fight the hardships and privations of the pioneer, he remained on the farm during the dry years and by energy and economy reached prosperity and success. He added to his land holdings and retained possession of his original land entry. He did his full share toward advancing the growth and upbuilding of the region and always had at heart its best interests. He was the man who volunteered to carry the news to Fort Hartstuff at the time an Indian uprising was feared, in 1876, riding an old gray horse belonging to Mr. Higgins, and armed with a horse pistol. Captain Munson, at the fort, sent back word to the settlers that they should inform him immediately of any trouble, and while waiting for the troops fight for themselves. In the fall of 1873 Mr. Allen returned to Illinois and married Melissa Curfman, daughter of Joseph and Eliza Curfman, and soon afterward brought her back to Nebraska with him. He gives much of the credit of his success in life to his wife, who is a woman of energy and a high order of intelligence, highly esteemed by her many friends. Mr. Allen is locally well known as "Ben Allen, the singer," and for twenty-nine years has been a chorister. March 1, 1911, he left the farm and came to Comstock to reside, engaging in general mercantile business as a member of the firm of Dvorak & Allen. They are among the leading merchants of that part of the county and have a thriving business. eighteen, range seventeen, has three children; Bertha, at home; and Celia, wife of William Zablondil, of Comstock, has one child. The subject of this sketch, although still a young man, has been a witness of all the hardships of pioneer days in the west. He was born in Illinois on July 16, 1872, and is a son of John Ladd, a native of Pennsylvania, who left that state in his early years and resided in Illinois for a number of years. There he met and married Araminta Warner, who was born and reared in Illinois. About 1879 the family came into Nebraska, first settlement being made in Washington county, near Blair, where they remained up to 1884, then came on to Knox county. John Ladd secured a homestead about eight miles northwest of Creighton, and made that his home until 1901, when he moved to South Dakota, and located in Hot Springs, where he now resides. Our subject started out for himself at the age of nineteen years, renting a tract of land which he farmed up to 1902. He then came to Creighton for residence, engaging in the livery business which he carried on for two years, and then opened a meat market, in which he has developed a profitable trade through fair dealing and strict attention to his business. Mr. Ladd has seen considerable of the progress that has come to the locality since his advent here. He has witnessed the settlers filling up the country, the farms and roads have been marked by fences, and he feels that he has been a part and parcel of this growth. On July 16, 1904, Mr. Ladd was united in marriage to Mrs. Elizabeth Raynor Johnson, who is a native of Sweden. Mr. Ladd is an independent in politics. He is a member of the Independent Order Odd fellows, also of the Woodmen of the World, and takes a leading part in the affairs of his town. Garrett Van Camp, who for the past many years has been successfully pursuing agriculture in Boone county, is a gentleman of energetic spirit and capable mind. He has a pleasant home in section eleven, of Oakland precinct, and there enjoys the fruits of a well-spent career. Mr. Van Camp was born in Waukesha county, Wisconsin, on September 14, 1846, the youngest of two children in the family of Hiram and Sallie Van Camp, the former a native of New York state, and the latter of Pennsylvania. The father of Hiram Van Camp, whose given name was Moses, was a Major in the Revolutionary war, the family being a famous New England family that took part in its early history. Our subject grew up in Sauk county, Wisconsin, from his eighth year, remaining there until he was twenty-one. He received at common school education, and started for himself when he was seventeen, obtaining work in the lumber camps, and did rafting and logging and river driving for two years. In 1864 and 1865 he was in the government service, connected with the United States troops, his enlistment running for six months at a time and these troops being known as Uncle Sam's goverment men. His term of service was at DuVall's Bluff and Little Rock, Arkansas. He returned to Sauk county after his service in the army and on the fourth day of October, 1866, was married to Laura Randall, who was a native of Wisconsin. After his marriage he settled on a farm and began hop growing, following the work for three years, then moved with his wife and son Victor, to Guthrie county, Iowa, where he engaged in grain and stock farming. He was very successful, but decided to go further west, so in company with W. M. Randall, and J. B. Barnes, came to Boone county, Nebraska. These three men were brothers-in-law, and had been schoolmates and friends for years. They homesteaded on adjoining claims upon their arrival here, and these original homesteads are still, owned by their families, although Mr. Barnes and Mr. Randall are deceased. Mr. Van Camp's claim was on section eleven, township twenty-one, range seven, and this is his home at the present time, having developed it into a finely equipped farm consisting of four hundred and twenty acres and has a beautiful modern residence, and plenty of shade and fruit trees, all planted by his own bands. He remembers distinctly the early days who from hardships and small means has come into success and prosperity, always being identified with the best interests of his county, and an honored member of the Boone county's pioneer association. He has acted as Road Supervisor of his district for many years. Mrs. Van Camp died in October, 1879. By this marriage there were two children. Victor and Eva. Mr. Van Camp was married the second time on December 3. 1893, to Laura Whipple, who was a daughter of Ira Whipple, a prominent pioneer of Boone county. Two children were. born of their union, Elgie, who married Erwin Hunter, living in Boone county, and has one child; Floy, who lives at home. The second Mrs. Van Camp died in February, 1900. Mr. Van Camp and his sons together control about eight hundred acres of fine land in the place known as the Van Camp Farm, and are classed among the wealthy and progressive citizens of their locality. a prominent place is accorded the name of George Cooley, who owns a fine sheep ranch and a good farm, and resides in a comfortable home in section twenty-nine, township twenty-six, range seven. For many years past Mr. Cooley has been engaged in agricultural pursuits in Blaine precinct and has done his full share as an old settler towards the development of the better interests of community, and enjoys the respect and esteem of all who know him. Mr. Cooley is a native of Athens county, Ohio, where he was born February 29, 1848. He is a son of George W. and Lucinda (Baker) Cooley. Our subject's father was born in the same county, July 4, 1811, and died March 17, 1889. The grandfather was a native of England, and his mother of Ireland. Mr. Cooley's father wanted to enlist in the ranks at the outbreak of the civil war but was not eligible, so he engaged as a teamster and traveled through Kentucky and other parts of the south. At one time his team was kiIled by a stroke of lightning and he was stunned by the shock for a half day; he was discharged for disability. The mother was a native of Belmont county, Ohio, her parents being of Pennsylvania German stock, the mother a Virginian, where the family were slaveholders in the early days. On October 11, 1867, Mr. Cooley was united in marriage to Miss Emeritta McGill. They are the parents of three children: John, Sarah, and Fred. John is married to Miss Irene DePiel and has lived in Alberta, Canada, since March, 1910. On October 20, 1881, Mr. Cooley with his family, left Ohio, going to Topeka, Kansas, where they remained six months, and thence drove to Antelope county, reaching there February 23, 1882. They took up a homestead and timber claim in section twenty-eight, first building a small frame house in which they lived for a short time, later erecting a good house which is their present residence. Mr. Cooley can relate many interesting incidents connected with pioneer life. During a hail storm the fifth of July, 1883, Mr. Cooley was in a gulch with his team, the small trees being the only protection from the pelting of the terriffic hailstorm. He lost all his crops in a similar storm the fifteenth of July the year following. During the memorable blizzard of January 12, 1888, he was out all afternoon getting his cattle under shelter. Prairie fires were a source of great danger in those times and the hardships endured by the early settlers were almost beyond the understanding of the present generation. While the hardships were great, there was a bright side to the pioneer life. Wild game was plentiful; deer and antelope roamed the country over and occasionally a big grey wolf would be seen. Mr. Cooley is prominent among the old settlers and is respected as a man who has done his full share in developing the country in which be lives. He has always taken an interest in public affairs; politically, he is an independent republican. Arthur N. Grierson was one of the original homesteaders of Custer county and belongs to a family that has been influential in furthering the best interests of central Nebraska. He is a native of Whiteside county, Illinois, born July 13, 1865, the fourth of the seven children in the family of Alex and Ann (Dunn) Grierson, the father being also an original homesteader in Custer county. He built the first mill at Westerville, freighting the lumber from Kearney; the dam was built of cedar logs from Cedar and Wagsall's canyons. For five years the father bought grain at Filmore and Exeter, Nebraska. Both parents were born in Scotland and the father now resides in Elgin, Illinois, where the mother's death occurred July 10, 1904. They have a son in Iowa, another in New York state and one in Oregon, and their three daughters live in Grand Island (Nebraska), Illinois, and California, respectively. Mr. Grierson reached manhood in his native state and there attended the common schools. When he was nineteen years of age he came to Custer county, joining his father and brother who had preceded him by three years. Later he secured a homestead of one hundred and sixty acres of land in what was commonly called Lee Park district. On February 28, 1889, he was married in Myrtle township to Miss Frances Cooper, a native of St. Charles county, Missouri, who had been a teacher in the schools of Nebraska. Their home for the first years was on the homestead farm, but in 1906 Mr. Grierson purchased a farm of the same size on section thirty-one, township sixteen, range eighteen, near Ansley, where the family have since resided. He has continued to improve and develop his land and now has a well-equipped stock farm, with a comfortable residence and other suitable builidngs [sic]. Three children have been born to him and his wife: Nellie M., a teacher of Ansley public schools; Lois E. and Francis M., at home. of the anti-saloon league of Agency City, Iowa. Mr. and Mrs. Grierson lived in a "soddy" most of their married life; in 1909 they moved into their commodious frame dwelling, which makes a fine appearance in that part of the township. An uncle of Mrs. Grierson was married the day of the fearful blizzard of January, 1888; Mrs. Grierson was attending school at Westerville at the time. Mr. Grierson happened to be in the barn feeding and found his way to the house by following the clothes-line. Grand Island was their market place in those days, and a long, weary journey it was, freighting up the valley from that point. Mr. Grierson is a republican in political views, and a member of the Independent Order of Odd Fellows, and the Modern Woodmen of America. Henry D. Kasson was born in Forkston township, Wyoming county, Pennsylvania, April 15, 1841. He came to Nebraska in February, 1873, and took a homestead in the southwestern part of the state, and lived there for eight years. On account of dry and hot winds, he then sold his land and bought land in Valley county, Nebraska. On October 20, 1881, he was married to Louise M. Weber, at Philadelphia, Pennsylvania. She was born in Cleveland, Ohio. Mr. Kasson has a long and creditable war record. The following is a record of his army service: He was enrolled as a soldier on the twenty-sixth day of October, 1861, in Company B, Fifty-second Pennsylvania Volunteers. Engagements: Lee's Mills, Virginia, April 29, 1862; Williamsburg, Virginia, May 5, 1862; Chickahominy, Virginia, May 19, 1862; Reconoissance to Seven Pines, Virginia, May 24, 25, and 26, 1862; Fair Oaks, Virginia, May 31, 1862; Railroad and Bottom's Bridge, Virginia, June 27, 28, and 29, 1862; White Oak Swamp Bridge, Virginia, June 30, 1862; Carter's Hill, Virginia, July 2, 1862; Siege of Yorktown, Virginia, commencing August 17th to December 31, 1862; James Island, South Carolina, July 16, 1863; Siege of Fort Wagner, Morris Island, South Carolina, July 20 to September 7, 1863; promoted corporal September 7, 1863; Siege of Charleston, South Carolina, September 7, 1863. Discharged at Morris Island, South Carolina, Jannary 1, 1864, by reason of re-enlistment as a veteran; re-enlisted January 1, 1864, to serve three years or during the war; Siege of Charleston commencing September 7, 1863; promoted sergeant January 28, 1864, Siege of Charleston continued until February 18, 1865, the rebels evacuating the city. The Fifty-second Regiment immediately took possession of Charleston, South Carolina, March 17, 1865. The Fifty-second Regiment immediately marched on board of the transport boat called New York, sailed to Morehead, North Carolina, landed March 21,1865; marched to Newbern, North Carolina, March 22, 1865; marched from Newbern, North Carolina, April 3, 1865, for Goldsborough, North Carolina; reached Goldsborough, North Carolina, April 7, 1865. The Fifty-second Regiment assigned to the First Brigade, Second Division of the Twenty-third army corps, commanded by General Scofield. On April thirteenth they had marched to and taken possession of Raleigh, North Carolina. From Raleigh marched to Salisbury, North Carolina, reaching that place May 11, 1865. The First Brigade was detained at Salisbury, North Carolina, to do provost duty. The Fifty-second Regiment was mustered out of service at Salisbury,. North Carolina, July 12, 1865; left Salisbury, July 13, 1865, for Harrisburg, Pennsylvania. Discharged at Harrisburg, July 21, 1865. A view of Mr. Kasson's place is presented on another page. 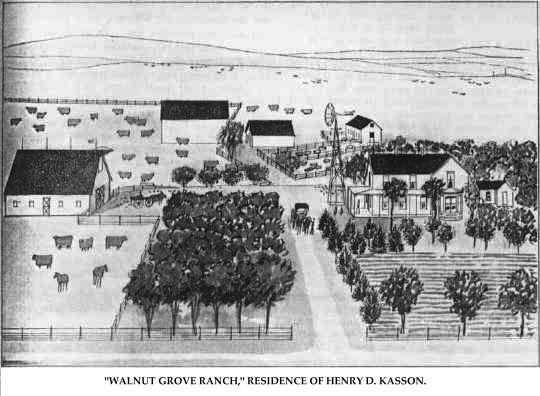 "Walnut Grove Ranch," Residence of Henry D. Kasson. Among the natives of Illinois who have located in Nebraska and become prominent in the upbuilding and development of the latter state may be mentioned Marion G. Hays, of Custer county, a self-made man, who came to the state without capital and has won a high degree of success. He was born in Lexington, McLean county, Illinois, August 25, 1850, the elder of the two sons of Henry and Almarine (Henline) Hays, the father a native of Virginia and the mother, of Kentucky. His brother, Frank S., came to Custer county about 1890 and lives on a farm which he owns. Marion G. Hays was reared on an Illinois farm, where he resided until coming to Custer county in 1883. He has been practically winning his own way in the world since his fourteenth year, as his father died when he was about eight years of age. His mother, who remarried, died in Illinois in 1908, although for some years prior to her death she lived with her sons in Nebraska. She reached her eighty-sixth year.